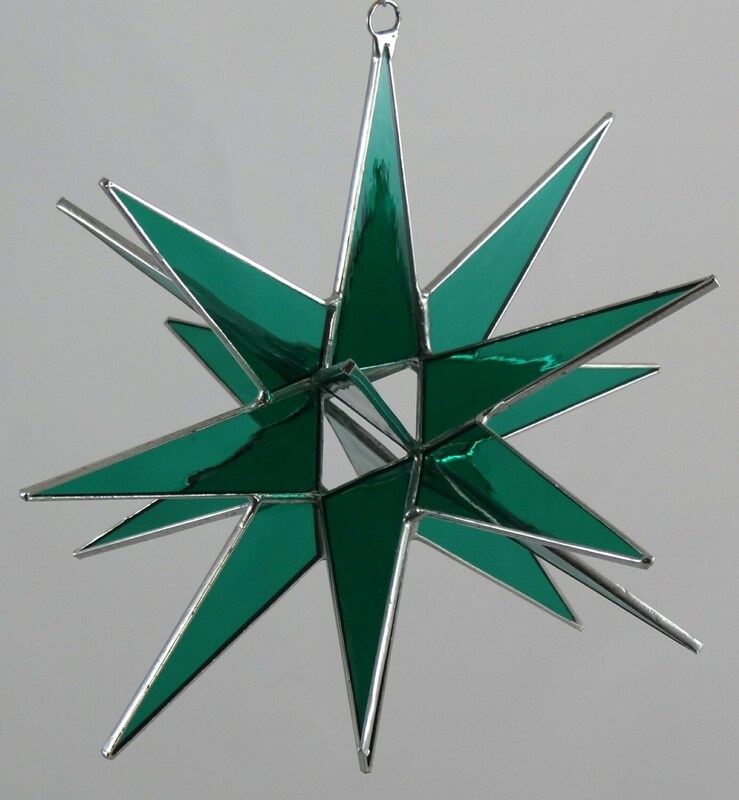 This beautiful 18 Point star is handcrafted in our stained glass studio formerly located in Bethlehem, Pennsylvania. The star measures approx. 8 1/4" in diameter and is crafted with teal water glass. Because each star is hand polished, the silver finish simply sparkles. Our stars are available in a few local retail stores and come in many other sizes and colors. Please inquire for other sizes and colors. Due to the quality of our handmade stars, you can find our stars on several national retail sites. If you have any questions regarding our stars, please email us at info "info@glassartbyjoe.com" or call us at 570-366-2843. - Visa, MasterCard, American Express, Discover, PayPal, Apple Pay or Etsy Gift Cards. The time I need to prepare an order for shipping varies. Please see the individual items for details on shipping times. All Returns or Exchanges must be shipped back within 14 days of delivery. - If the item is not returned in its original condition, the buyer is responsible for any loss in value. -Buyers are responsible for return shipping costs and the replacement item's shipping costs. - Custom or personalized orders (Custom or personalized work is defined as any item that was produced specifically for a customer). - Please contact me if you have any problems with your order. - Restocking fees may apply. - To communicate with you about your order. - To fulfill your order. - For legal reasons (like paying taxes). Colors may slightly vary from the pictures as glass can be difficult to photograph. For custom orders of new designs, a $25.00 design fee is required before any work will be started. Payment in full is required when you approve the design and the price quoted. At that point, I will create a private listing for you to purchase the item. I will develop your design based on a detailed conversation or messaging with you about the type of piece you desire, including the topic and style (person, animal, scenery, flowers, geometric, etc. ), the size and where you plan to display it, and the texture and colors of glass you prefer. I can also design from photographs or pictures. I will send you pictures of glass colors and textures to choose from. The turnaround time depends on the size of the piece and the type of glass requested, but will be quoted along with the pattern and price. Naturally, all glass items should be handled with care to prevent breakage! Hanging Tips: Rectangular panels should be hung from TWO separate chains or wires so that they are vertical to the piece. This will prevent the frame from warping over time. Suction cup hangers should only be used for pieces weighing less than one pound. For a stronger bond to the window, wipe a VERY tiny film of cooking oil on the inside of the suction cup before putting on the window. Oil won't evaporate. It is normal for the solder and framing to dull/tarnish over time. You can choose to let it age naturally, or you can clean/polish it with a stained glass polish. Car wax works well too. Clean the glass with a soft dry cloth if smudged or dirty. I am happy to enclose a personalized note with your order if it is being shipped directly to giftee. Just include the message you would like in the notes of your order. However, I do not offer gift wrapping of the package itself. Please note that because no two pieces of glass are alike and availability can vary, made to order pieces may have slight variances from the pictures shown, but every effort will be made to duplicate or match the original as closely as possible. If I need to make a significant change to a type and/or color of glass used in a piece, I will notify you and provide pictures of the replacement glass before making it so that you may choose to cancel the order and receive a refund if you are not happy with the new glass option. I make every effort to portray accurate colors in the photos on each listing. However, due to the nature of photographing glass, stained glass variations in different lighting, and the variations inherent in different computer monitors, actual colors may appear slightly different in your home than what is shown in my shop photos. However, I believe you will find that each item will actually look BETTER in person than in the photos! (At least that's what my customers have told me). I ship all items in very well-padded packaging, but once in a while, the Post Office still manages to cause breakage during shipping. If your item arrives damaged, I require that you please notify me via Etsy message within 5 calendar days of receipt (as indicated by USPS tracking) and include photos of the damaged piece and packaging. Please keep all original packaging. I will file a USPS claim, and you can decide if you prefer a refund, or a replacement. All designs and photos remain the property of Glass Art by Joe Stained Glass Studio, LLC, and may not be copied, downloaded, duplicated, or used in any way without my express written consent.